The Central Committee of the Communist Party of China (CPC) Wednesday announced the latest reshuffling of the provincial leadership, which comes on the heels of the election of the new State-level lineup last month. Hebei governor Guo Gengmao was appointed deputy secretary of the CPC Henan provincial committee in accordance with a CPC Central Committee decision, paving the way for him to become governor of Henan. Guo, 58, replaced Li Yucheng, who will move to another post, the Central Committee said. Li is also the governor of Henan. A native of Hebei, Guo joined the CPC in 1972. He graduated from the Party School of the CPC Central Committee and has a master's degree in political economics. From 1975 to 1997, he held leading posts in Renji and Zaoqiang counties and in Xingtai city in Hebei. 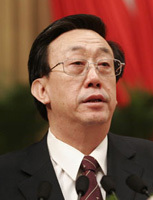 From 1998 to 2006, he was vice-governor of Hebei and was appointed acting governor and deputy Party secretary of the province in 2006. Last January, Guo was elected governor of Hebei at the people's congress. He was also elected a member of the 17th CPC Central Committee in October. Meanwhile, Hu Chunhua, first secretary of the Secretariat of the Central Committee of the Communist Youth League of China, has been appointed deputy secretary of the CPC Hebei provincial committee following a CPC Central Committee decision.